Griffith Hall provides a beautiful rustic meeting and banquet space year-round. The room’s prime location offers beautiful views of the surrounding trees in spring, summer, and fall, and spectacular views of the lake during the winter. 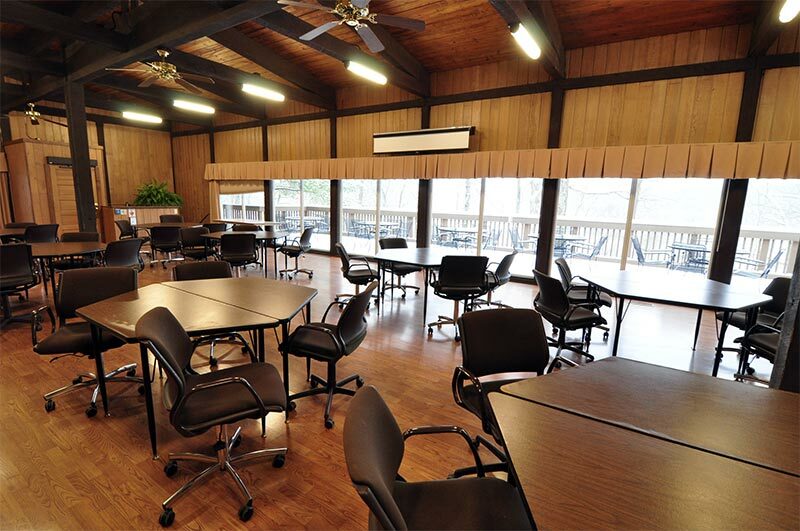 The main meeting room can accommodate up to 60 people with tables and chairs (typically set up in rounds of six). This facility is a popular venue for management training events, and banquets. It is also located near the Griffith Cabins and has convenient parking nearby in Griffith Village. Griffith Hall does not have built-in AV or Wi-Fi, but options are available for rental - please speak with your event coordinator. Rate: $185 per day. Kitchen rental is $100.